At one point, one of the horse even kicked the suspect. 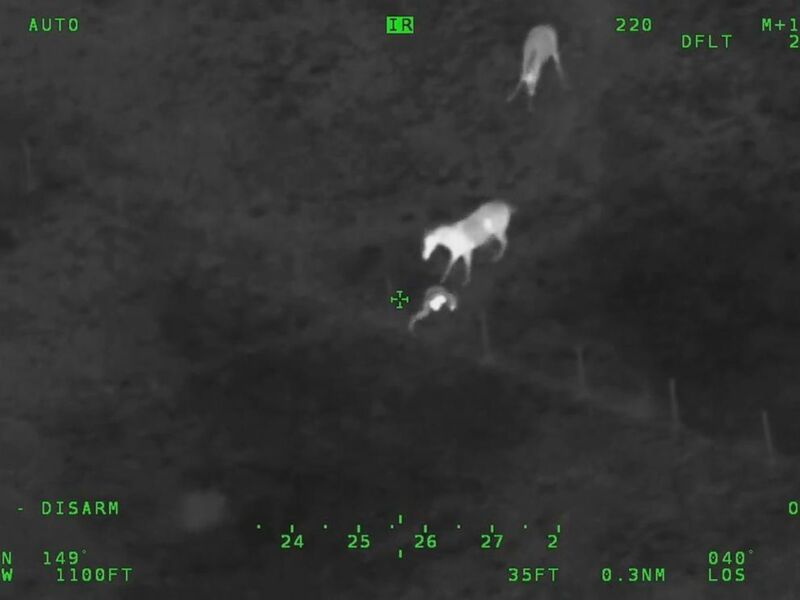 A trio of crime-fighting horses helped sheriff's deputies in Florida saddle a fleeing suspect, video shows. Aerial footage released by the Volusia County Sheriff's Office begins as the suspect drives his vehicle across a lawn in a residential neighborhood. (Volusia County Sheriff's Office) A trio of horses helped the Volusia County Sheriff's Office in Florida nab a fleeing suspect. The suspect then drives the car past a curb and into the backyard of a home on a cul-de-sac, abandoning it there before he starts running on foot through an open pasture. "There's a field back here with what looks like farm animals," a dispatcher is heard telling deputies over the radio. "He's crossing into the field now." Three horses spot the man as he runs across the pasture and and take off after him. At one point, the lead horse kicks the man, throwing him to the ground, before it runs away. (Volusia County Sheriff's Office) VIDEO: The man was eventually captured by police and charged with attempting to elude authorities and other crimes. He's crossing into the field now...Jumped over a fence. Horse just chased him down. "Jumped over a fence," a dispatcher says over the radio. "Horse just chased him down." The dispatcher then instructs the deputies of the suspect's whereabouts, telling them he's "20 feet to your left." Body camera footage from one of the deputies shows authorities handcuffing the suspect on the ground as a police dog barks excitedly at the commotion, telling the suspect not to move or resist arrest. The man was charged with two counts of fleeing and attempting to elude, resisting without violence, driving with a suspended license and violation of probation on a previous charge of aggravated battery on a law enforcement officer. The sheriff's office did not release the name of the suspect.